We don't know why the owner of this Jongert sailboat preferred the name "Ameena" over the many others possible, but a sailor - the owner in question really is one, and we shall see why - knows well that this is an important and never random element. freshwater production capacity: 3.000 litres/24 h.
For further information contact B.V., Kluisgat 1, NL-1771 MV Wieringerwerf, The Netherlands; tel. +31 227 542544; fax +31 227 541246; website www.jongert.com; e-mail info@jongert.com. The origin of the name is African, it is Swahili for "trustworthy". All this might have nothing to do with the real reasons behind the owner of "Ameena" giving her this name, which could belong to a woman, taking on in this case a meaning charged with various emotional impulses. 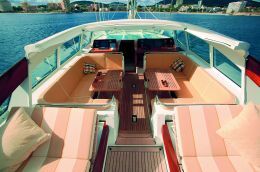 Yet the meaning of this name partly finds a response in the features of this yacht which combines great cruising qualities and racing performances, thus meriting the trust of the owner on the occasions when he likes to skipper his own boat personally. 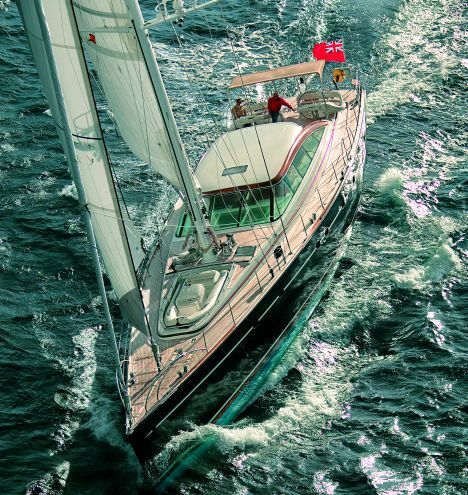 Moreover, the creation of similar projects oriented as much towards cruising as racing has always been a prerogative of the Dutch yard which for more than 50 years has been investing resources in research and development with regard to this type of yacht. In the list of priorities given to the yard's designers to develop the boat of his desires the owner included elements such as: the possibility to cruise in the Mediterranean with his family, to handle the boat personally with a minimum crew and to be able to successfully take part in races; a rig that could carry various sail combinations and, in general, a vessel capable of crossing the Atlantic to reach the United States coast and the Caribbean. Of course all of this some years ago would have seemed impossible or, at the least, manageable only with a design based on a long series of compromises. But thanks to the materials which have been increasingly used by shipyards in recent years, both for structures and equipment, the Dutch yard succeeded in combining the owner's various requirements in the creation of "Ameena". 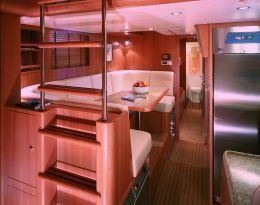 Development of the design was handled by the yard in collaboration with the well known designer Tony Castro who, in this semi-custom for an owner who also has another Jongert, remained faithful to the water lines of the previous Jongert 29m he designed, developing a new rig and a new deck layout and of course new interiors. 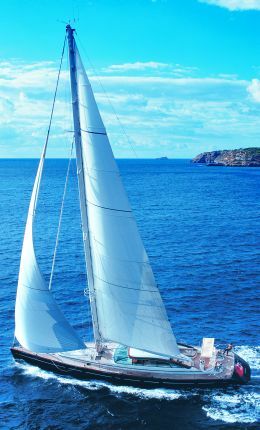 The result is a yacht that can meet the needs of an owner accustomed to sailing and to handling his own boats personally, be it a family cruise or a race. "Ameena" combines simplicity of steering and handling of the generous sail plan (performance under sail that achieves a maximum speed of around 13.5 knots) with interiors where six guests can stay in maximum comfort. The crew's quarters are in the forward zone of "Ameena" and include a dinette opposite the galley and service room, forward of which are two double cabins with bunk beds and private bathrooms. 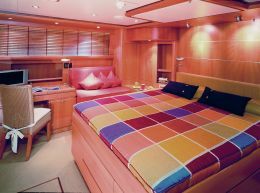 Continuing below deck, the owner requested two double- bed cabins, one occupying the entire aft area and the other situated aft of the mast area, opposite a third cabin which has twin beds. 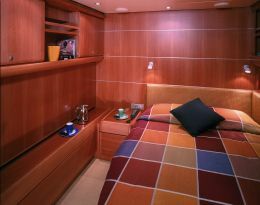 The suite fully aft includes an office corner, a sofa, a dressing table area, a large bathroom with separate shower space, a wardrobe cabinet and a centrally placed bed. 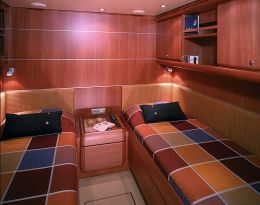 The double- bed cabin for guests consists of a bed set against the port side bulkhead, private bathroom with separate shower space and with access from the single corridor that links all the spaces of the night zone, including the twin bed cabin, which also has a private bathroom. The indoor living area is developed forward of the night zone. Here we find a large C-shaped sofa with table, set opposite an L-shaped divan with coffee table, writing desk and armchairs. This area benefits from natural light provided by the forward deckhouse windows and extends over the entire beam. 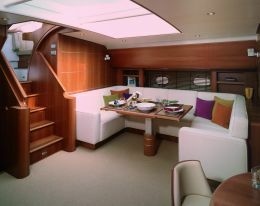 Moreover, stairs lead to the living area on the main deck, The deckhouse, with its sophisticated but not excessive design, features side walls in glass with uprights and upper support in wood which, at the after edge, joins the level of the deck, a stylistically very efficacious solution that contributes to giving this yacht a modern and at the same time very elegant appearance. The covering of the deckhouse is rigid but does not reach the aft extremity of the wooden uprights. 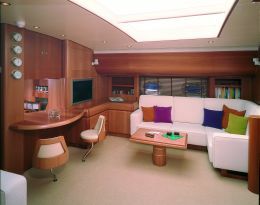 In fact aft of the saloon on this deck there are two large C-shaped sofas with a central table and covered platform, plus two sundecks followed by the double wheelhouse, enclosed in an elliptical structure, which includes the two steering stations, complete with instruments and perimeter seating. If need be this area can be protected by a soft top with a steel frame, retractable when not in use. The structure housing the open air bridge on the aft edge also houses two large size winches for the sheets which are run through passages in cavities within the deck, thus leaving the latter always clean and unencumbered. On the main deck there is also a well which has the twofold function of housing the tender or, when the auxiliary means is in the water, being transformed into a swimming pool. At this point we should pause over a few details of a technical nature: for example, the hull is in aluminium, so weights and their distribution could be managed optimally, while the superstructures and deckhouse are in composite material. 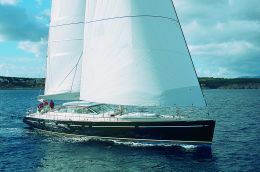 As for the generous sail plan, with a cutter rig developed by Rod Rigging, the mast and boom by Nirvana Spars are in aluminium and the sail carried may be 405 sq, m. with mainsail and genoa or 285 sq. m. with main and staysail. The whole can be handled by a crew of only three people who have numerous aids at their disposal such as motorised winches, instrument repeaters, centralised control of running rigging and other devices that make a 29 m. yacht like this one a relatively simple vessel to sail.